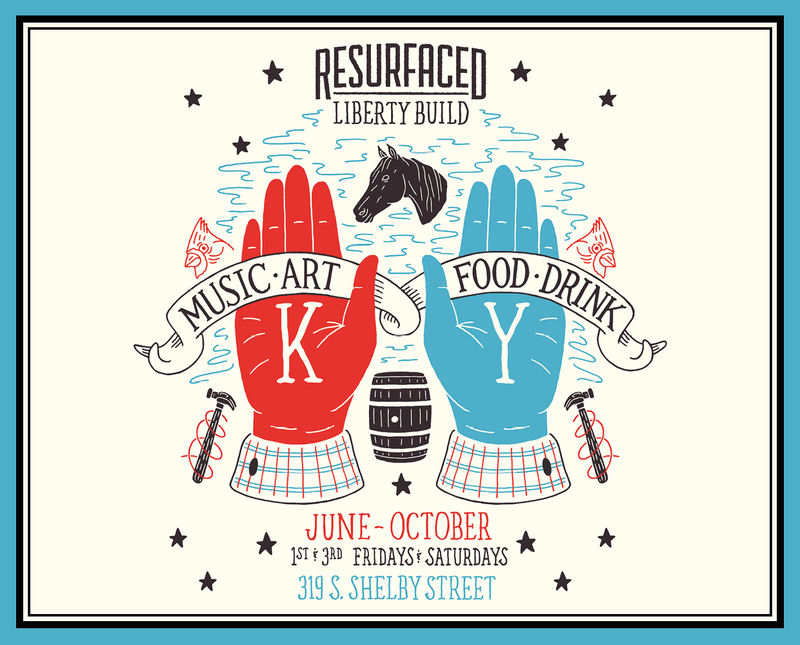 (Louisville, KY) – City Collaborative (CC) has announced ReSurfaced® The Liberty Build’s lineup for the first weekend in August. ReSurfaced® The Liberty Build has transformed the formerly vacant lot on the corner of East Liberty and South Shelby Streets (319 S. Shelby Street) into a community activation space that fosters civic engagement and entrepreneurialism. On Friday, August 4th ReSurfaced® is open from 4 – 11 p.m. and is free and all ages are welcome. On both Friday and Saturday night, The Forest Giant Gallery space will host a new exhibit “The Natural View” by Brendan Taylor, a rising sophomore attending Eastern High School. The up and coming artist now attends classes at The Academy of LVA, and is part of the art community at his high school as an upper level art student. DJ Dwight Johnson, a DJ veteran for 25 years, will be spinning Old School/New School Hip Hop, Funk, Boogie and Dub/Reggae, and Jazz on vinyl from 9 – 11 p.m. 502 Café will be serving and Braxton Brewing will be pouring all weekend. Saturday’s lineup will feature a Fun Market featuring arts, crafts, and baked goods by some of Louisville’s most talented youth. All vendors in the Fun Market are between ages 6 and 16, and they will be donating some of the proceeds to benefit the Louisville Rescue Mission. Every person who purchases from the talented, youthful vendors will be entered in a raffle to win free school supplies. If you have a crafty child sign them up to be a vendor, go to www.citycollaborative.org/fun-market. From 5 – 7 p.m. Strive, Insrument Village, which provides wellness opportunities to the Louisville community, will be at ReSurfaced® inviting attendees to join their musical journey and jam on some instruments. DJ Drew Thompson will perform from 7 – 8 p.m., followed by live music by Amarriah Russell. More live music will be performed by Anemic Royalty from 9:30 – 10:30 p.m.